HomeNewsJoin me for a discussion of the largest grassroots environmental movement over the next three weeks! Join me for a discussion of the largest grassroots environmental movement over the next three weeks! Wednesday at a celebration of mesquite food artisans and book release of Mesquite! on Tucson’s Tumamoc Hill, the Tucson City of Gastronomy non-profit released its publication, Baja Arizona Artisanal Food Products. It features 108 food products from the Tucson basin made accessible and affordable by 52 local food producers who process native plants, honey and heirloom crops into delectable foods and beverages. The same day, my new book Food from the Radical Center was first publicly presented at the same event, to remind us that this phenomena is helping restore food-producing landscapes, create new livelihoods and nourish our communities. Biocultural and eco-culinary restoration is not just an idea; the restoration economy in our state is among our top five land-based industries in the West, along with ranching, mining, forestry, and tourism. Join me for a discussion of the largest grassroots environmental movement you’ve hardly heard of at events in Tucson, Phoenix, Prescott, Madison area (Fermentation Fest), Santa Fe, San Francisco, Palo Alto and Point Reyes over the next three weeks. For times and places, check my events, https://www.garynabhan.com/events/. We need to resist the disease that has sickened our societies the last few years. What do we tell those security forces who are still working? Food From The Radical Center Needs to Reach Refugees in the U.S.
What stories do we tell about the world, when we are left to ourselves, during times of fear? 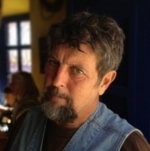 Gary Paul Nabhan is an internationally-celebrated nature writer, agrarian activist and ethnobiologist who tangibly works on conserving the links between biodiversity and cultural diversity.